John Smillas Lord and Helen Eliza Veeder were my 3rd great grandparents. They were married in 1873 in Clarion, Wright County, Iowa. They lived there until they both died. I had information for five of their children. It wasn’t until I discovered the Clarion Public Library has free, public access to digitized local newspapers, that I found out there was a sixth child. Helen died just a few weeks after giving birth, and then the baby, Ellen, soon followed. John remarried a few years after Helen’s death. He died in 1927, of acute dilation of the heart and chronic endocarditis. “Galt,” Wright County Monitor, 16 Oct 1895, p. 5, col. 4; digital images, Digital Archives of the Clarion Public Library (clarion.advantage-preservation.com/ : accessed 30 Jun 2017). Rec. Date: 30 Jun 2017. 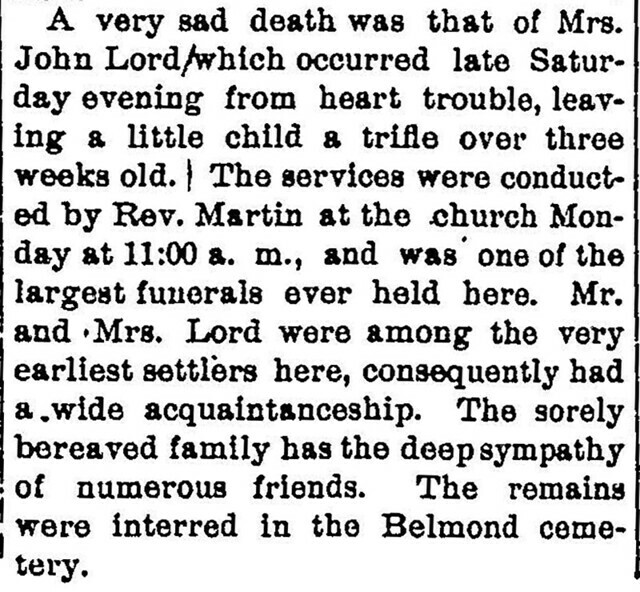 A very sad death was that of Mrs. John Lord which occurred Saturday evening from heart trouble, leaving a little child a trifle over three weeks old. The services were conducted by Rev. Martin at the church Monday at 11:00 a.m., and as one of the largest funerals ever held here. Mr. and Mrs. Lord were among the very earliest settlers here, consequently had a wide aquaintanceship. The sorely bereaved family has the deep sympathy of numerous friends. 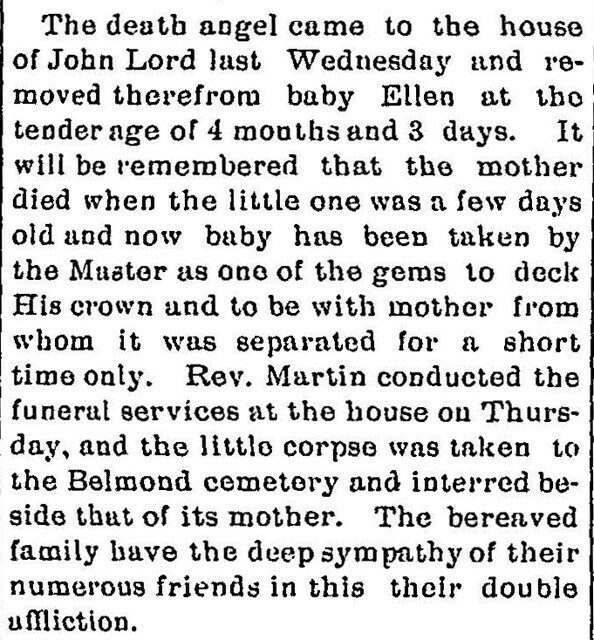 The remains were interred in the Belmond cemetery. “Local Transactions,” The Wright County Democrat, 16 Oct 1895, p. 6, col. 2; digital images, Digital Archives of the Clarion Public Library (clarion.advantage-preservation.com/ : accessed 30 Jun 2017). Rec. Date: 30 Jun 2017. The DEMOCRAT is exceedingly pained in being called upon to note the death of Mrs. John Lord, who resided some three miles southwest of Galt. The deceased after a severe illness of three months, succumbed to the monster, heart disease, and passed from this terrestrial sphere to her celestial home. The funeral ceremony took place at Galt, after which the remains were removed to Belmond for interment, Rev. Martin, of Rowan, officiating. John S. Lord was born in Coldwater, Mich., August 10, 1848, and departed this life at his late home in Clarion, April 14, 1927, aged 78 years, 8 months and 4 days. He came with his parents in 1860 to Iowa, locating in Lincoln township, Wright county. After the death of his parents he became the owner of this homestead. On January 1, 1873, he was united in marriage with Helen Veeder and to this union were born six children, three sons and three daughters. The mother and two daughters have preceeded him in death. On November 23, 1899, Mr. Lord was united in marriage to Mrs. M. A. Pickering. More than thirty years ago Mr. Lord accepted Christ as his Saviour, and later was baptised, and was united with the Church of God, of which he remained a faithful member until death. His joy was to help carry forward the work of his Master’s Kingdom. As an early pioneer citizen he did his part well in helping to develop the country. Seven years ago last September, Mr. and Mrs. Lord came to Clarion, where they have since resided. Those who survive him and feel his loss most keenly are his companion, and his children, David J., Homer C., Hiram W., and Rachel, now Mrs. W. O. Mathews of Des Moines. The above mentioned sons all live in Wright county, with many friends and acquaintences who will long remember the well rounded life he lived among them. A brief service was held in the late home, and the service proper in the First M. E. Church at Clarion, Saturday afternoon, conducted by Rev. E. E. Heltibridle of Grundy Center, assisted by L. H. Smith of Newburg and Rev. O’Connor of Clarion. Interment was made in the family lot at Belmond, there to await the first resurrection morn.